Of the three major groups of Indian Jewry, which include Bene Israel and Baghdadi Jews, the commu- nity in Cochin (South India) is the smallest, with fewer than seventy Jews remaining in the area today. Many legends are told about the biblical origins of the Cochini Jewish community. Following the Indian caste system, Cochini Jews are divided into three smaller groups: Malabari Jews, or “black Jews,” merchants who believe they arrived on the Malabar coast during the period of King Solomon; Pardesi (“foreigners” in some Indian languages), or “white Jews,” who came to Kerala in colonial times from countries such Egypt, Holland, and Germany; and Meshuhrarim (“released” in Hebrew), merchant Jews’ slaves, who were converted to Judaism and later released. and rich Torah cases. Also outstanding is ketubbah decoration from Cochin, the leading center of this art form in India. The lavish and intricate decorative programs of the Cochini contracts often combine Eastern and Western designs in an original manner. 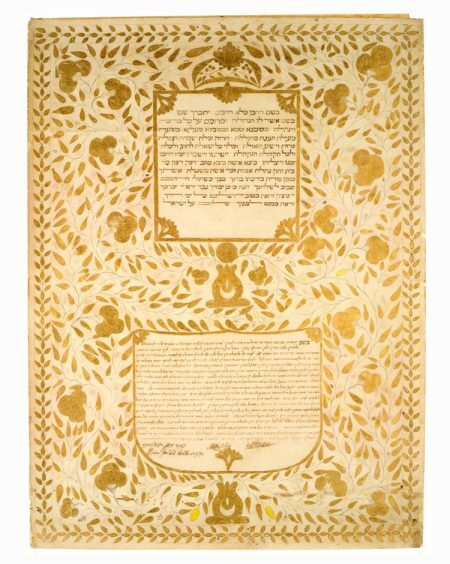 Typical of Indian ketubbot, the present contract is divided into two sections: an upper one dedicated to a lengthy superscription and a lower one re- served for the ketubbah proper. The superscription, which always comprises the same set of blessings and biblical verses, has its sources in the medieval Cairo Genizah ketubbot; it is identical with the superscription of Yemeni ketubbot. This text is invariably written in square letters, while the ketubbah proper is generally penned in semi-cursive script. Both sections are set in an attractive field of delicate floral motifs in bright tones of gold. A foliate garland frames the entire page, enclosing elongated branches delineated in pen and pencil, which contain some leaves painted yellow, while most are gold. A large gilt crown appears at the top center, which, as in ketubbot from Gibraltar (cat. no. 74), may signify both the British crown and the crown of the Torah.